The park features a full day of fun for the entire family – whether you zap your friends in Lazer Tag, challenge your skills in our MEGA Arcade, take a thrilling plunge down the waterslides, or just relax and float around the lazy river. Our parks are the safest and cleanest in the industry and provide an atmosphere that hard-working families from all walks of life can easily access and enjoy. 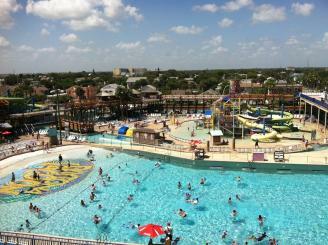 Daytona Lagoon's water park is a fun and exciting day excursion for the whole family. 12 Twisty, turvy slides, a lazy river, wave pool and kiddie area make up over 4 acres of water park excitement!